Zambian police have besieged the funeral of late veteran politician Daniel Munkombwe’s funeral in Choma and blocking mourners. But when Munkombwe was sick, Lungu never visited him in hospital but now he wants to shed crocodile tears while dancing on his grave. That is the type of hypocrite Lungu is. Last week, when Lungu was out of the country, people mourned minister of gender Victory Kalima in peace but now this Malawian corrupt thief is here to cause confusion. A number of high ranking dignatories including the UPND President Hakainde Hichilema are in Choma for the burial ceremony of late Munkombwe at his Kabebya farm. 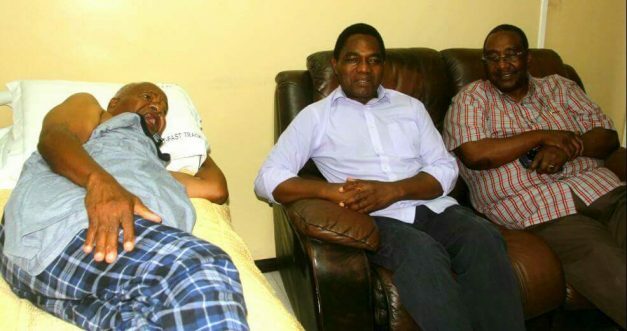 Edgar Lungu, who is also on the programme for the burial ceremony has ordered police to block mourners such as the UPND President Hakainde Hichilema and his entourage from accessing the funeral home. Police are screening and deciding who should attend the funeral and burial service of Mr. Munkombwe turning away a lot of mourners from the funeral home. Without consulting the family, Lungu has also banned party regalia at the funeral.